Durante di Alighiero degli Alighieri (; ), commonly known by his name of art Dante Alighieri or simply as Dante (; , ; – 1321), was an Italian poet during the Late Middle Ages. His ''Divine Comedy'', originally called '''' (modern Italian: ''Commedia'') and later christened '''' by Giovanni Boccaccio, is widely considered the most important poem of the Middle Ages and the greatest literary work in the Italian language. In the late Middle Ages, most poetry was written in Latin, making it accessible only to the most educated readers. 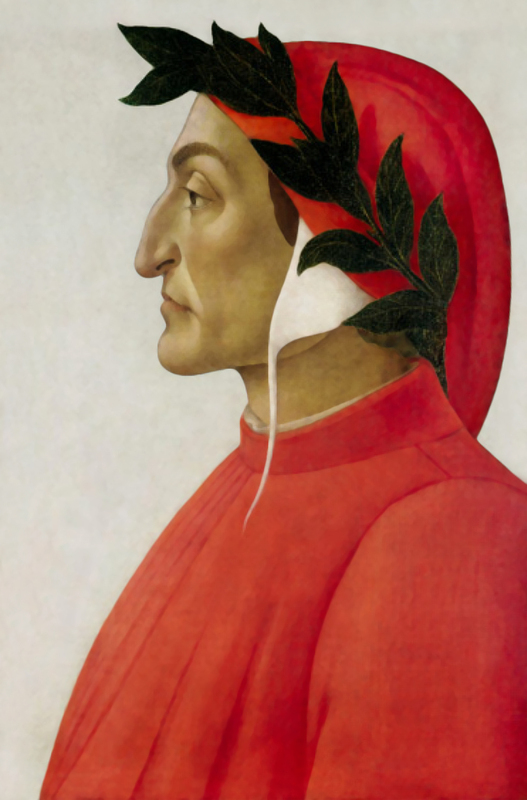 In ''De vulgari eloquentia'' (''On Eloquence in the Vernacular''), however, Dante defended the use of the vernacular in literature. He would even write in the Tuscan dialect for works such as ''The New Life'' (1295) and the ''Divine Comedy''; this highly unorthodox choice set a precedent that important later Italian writers such as Petrarch and Boccaccio would follow. Dante's Purgatorio; with a translation into English triple rhyme by Laurence Binyon.